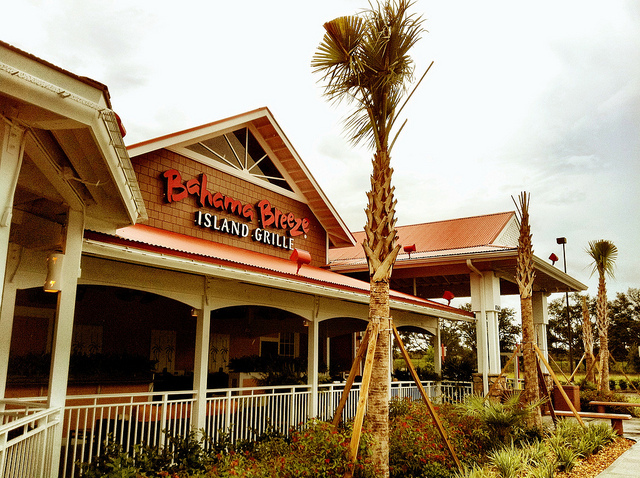 Bahama Breeze Island Grille was one of our favourite places to eat whilst we were in Orlando, Florida – we visited three times! We went to the same one each time on Highway 192 (W. Irlo Bronson Memorial Way) as it was closest. On our first visit, we went for lunch. We got to Bahama Breeze at around 12ish and ventured inside. We were shown a table and introduced to our waiter who was very friendly and accommodating. I was guessing more so than normal, owing to the fact that, at that time, we were the only customers! We were given three different menus – the lunch time, fish specials and snacks & small plates. We found most of the menus in restaurants in Orlando were huge and always needed more time to look through and decide what we would like! Liam had buttermilk chicken sliders as an appetizer ($7.99) and from the kid’s menu, a plate of bowtie pasta with tomato sauce ($4.29) which came with a tiny bowl of fruit on the side. Liam enjoyed his starter, but the buns were too buttery for him, so he took the chicken out and dipped it into our jerk BBQ sauce. It was a healthy portion for a starter – 4 sliders – he ate the lot! Steve and I shared two appetisers (the gannets that we were on this holiday!) of jerk chicken wings ($10.99 for 8) and firecracker shrimp ($8.99). The portions were considerably larger than any we had so far, and therefore, better value for money! The shrimp was “OMG, the best thing I’ve ever eaten, EVER!” and the wings were huge! In the UK we get half wings, and I guess that is what we were expecting. It was a shock to get the whole wing – and the waiter was surprised when we commented what a chicken wing is in the UK! The wings tasted good, and the suace on the side to dip into, was spicier than the wings themselves. I opted for the Cuban sandwich ($8.99, and another on the list of eats!). which can only be described as enough to feed 3 people! Liam ended up eating my chips (clearly, his sliders and portion of pasta wasn’t enough for a growing lad!) and Steve ate one half of my sarnie. It was delicious though! Steve went for the chorizo sliders ($7.29) as his main, but I think what was brought out was the starter portion, as it ‘only’ had two on there – considering Liam’s appetizer had four, he was expecting there to be a mountain of them! After all that, we managed to squeeze in a dessert, but let it be known that we didn’t have anything else to eat for the rest of the day!! Steve and I shared the key lime pie, which was delicious. The portion was huge (naturally! ), I would say double the size of a normal slice of pie! The service was great, the chef came out to ask us how things were with the food, and was proud to mention how much they make in-house. I thought that this was a nice touch, although, perhaps had it been busier we wouldn’t have got that, but, it certainly made us want to go back another time. We felt really well looked after all around: from the friendliness of the waiter, to the quality and price of the food. Our bill came to $74.15 and for the amount of food that was per plate, it was very good value indeed. We also gave our waiter a 20% tip. It’s been established that I take plenty of photos, and random ones at that…this is the bathroom sinks hahaha. I was impressed at the complimentary mouth wash to freshen up after your spicy food! Check out all my Orlando Dining experiences along with my trip reports here.